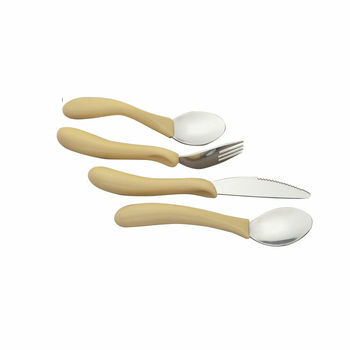 Caring Cutlery - A range of stainless steel utensils moulded into contoured, ivory-coloured plastic handles with built-up ends. These are of value to those either a weak grip and restricted wrist or finger movement. The knife and fork have a shaped indent on the top for the index finger, to help directional control. The knife also has a serrated blade to assist with cutting. In addition to the standard spoon, there is a right handed angled spoon with an angled handle to minimise wrist movement. Dishwasher safe.